Joyful geometric shapes dancing lively on a bold, fluo background. It’s the new Geometric Collection: Summer of ’87. Joyful geometric shapes dancing lively on a bold, fluo background. It’s the new Geometric Collection: Summer of ’87. Mixing bliss and nostalgia, this three-piece edition is decked out with vibrant patterns inspired by the magic vibes of the late 1980s. Let’s get the party started! 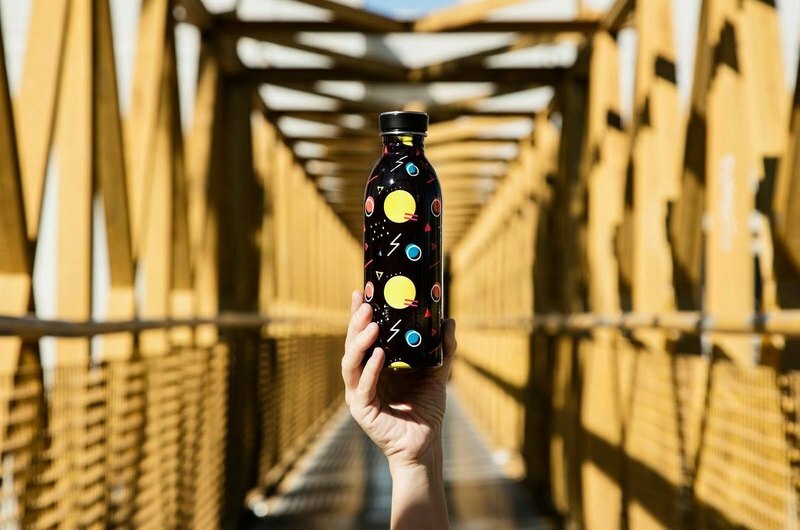 Possible imperfections in the graphic pattern are due to this special handprinting method that makes the graphic patterns look like different layers overlapping on the neck of the bottle. －－－ ABOUT 24Bottles is the Italian design brand born in 2013 with the mission of unburdening the planet from disposable plastic bottles, providing a collection of carefully designed, high-quality, easy-to-carry, sustainable stainless steel solutions for daily hydration on the go. We believe that good design can change things for the better and can help people improve their health and quality of life as well as their look, in an environmentally friendly way. Our aim is to combine form and function in order to offer uniquely lightweight collections of bottles, bags and accessories, so as to foster a more sustainable and comfortable lifestyle, while keeping personal style in check. －－－ Apart from offering a healthy solution for your daily hydration, our stainless steel bottles will also help you reduce your own carbon footprint. Day after day, every time you refill your Urban Bottle you will officially claim that you don’t need to rely on a disposable plastic bottle for your hydration. 0.08 is the number printed on our 500ml bottles. It is the quantity of CO2 you save from releasing into the atmosphere every time you choose to drink from your Urban Bottle instead of buying a disposable water bottle. 80 grams (0,08Kg) is indeed the quantity of CO2 released into the atmosphere for the production of a single-use plastic bottle. －－－ Together with Reteclima® we have assessed and certified that our Urban Bottle 500ml, from raw materials to production, packaging and transport, releases 543,3 grams of CO2 into the atmosphere. This is the equivalent of the production of just 6,46 plastic bottles of the same volume. https://www.24bottles.com/wp-content/uploads/2016/09/24b-carbon-assessment.png OFFSET － The Urban Bottle has net zero carbon footprint https://www.24bottles.com/wp-content/uploads/2016/09/24b-reforestation-projects.png What is even more important, is that the overall CO2 emissions coming from the production, packaging and transport of every single Urban Bottle are already offset through international reforestation projects. https://www.24bottles.com/wp-content/uploads/2016/09/24b-zero-carbon.png －－－ The perfect size BPA-free lightweight stainless steel bottle. Urban Bottle is the ultimate solution for your healthy and comfortable hydration on the go. Simple design, little weight. This sophisticated and handy reusable bottle is designed to weigh as little as possible in order to fit comfortably in your handbag while assuring a high drinking performance during your daily activities. Handy and durable, this Urban Bottle comes with a tactile satin finish in a variety of colours to match your mood of the day and to complete your outfit. https://www.24bottles.com/wp-content/uploads/2013/10/bottles.png CARE Hand wash recommended MATERIAL 18/8 food grade Stainless Steel SPECS Capacity: 500ml Weight: 100g (117g with lid) Mouth: Ø 3.2cm Base: Ø 6.5cm Height: 21 cm https://www.24bottles.com/wp-content/uploads/2017/02/24b-corevalues.png DETAILS - 100% BPA free, phthalates free, toxins free - Suitable for acidic and carbonated drinks - Does not retain or impart any flavour - BPA-free lid with leak proof silicone seal - One twist to open - Wide mouth for ice filling and easy cleaning - Not insulated (see Thermal Cover) - Fits adjustable bottle cages - Plane boarding allowance - Handle with care when using with hot liquids 24Bottles is distributed by Bike The Moment Store.